Todays Angel Flight was the reverse of what we flew yesterday (October 18th). We departed home base Luray at 10:05am and headed to Baltimore MD, where we picked up Connie and her mom Diane to fly them back home to Raleigh-Durham NC. Our flight conditions up to BWI were very good with a smooth ride, clear skies, and a nice little tailwind. As we neared BWI, we were vectored in for a very nice, close in, approach to runway 33R. This was probably the best visual approach we have ever been given coming into BWI, most of the time they take us fairly far out, then back in, to merge us with the traffic, taking up a lot of extra time and fuel. We arrived a little before Connie and her mom and were taking advantage of some complimentary cookies in the FBO as they came thru the doors. We could tell that they arrived by the glow and warm feeling that flooded the area from their wonderful smiles! We exchanged some more great hugs and found that Connie had good visits with her doctors she had come to see! We also found that they were willing to fly with us again! (It is always a good thing to have passengers that you have flown before be willing to fly with you again!) With this good news, we soon were loaded up ready to depart BWI for North Carolina. Our flight conditions taking the girls back home were again very good with a smooth ride, clear skies, a slight headwind, and fantastic views! As we arrived into the Raleigh area, we knew that a delay getting into Raleigh-Durham International would almost be guaranteed, due to them being so busy and just having one runway to use (normally they have 3) and for sure, we were vectored all around until they could merge us in with all the other traffic coming in! They had one coming in after the other continuously (and in between each arrival, they tried to do a departure as well) so, as one would land, one would take off, and most of the traffic was passenger airlines! Eventually, we got our turn and 49Bravo blended in with the big guys very proudly doing what she needed to do! After landing, the next major task was getting to the FBO (Tac Air) on the other side of the field. So with detailed instructions from ground control (which was extremely busy) everyone moving on the ground worked their way to where they needed to go. Eventually, we were parked and on our way into the Tac Air. In Tac Air we enjoyed talking with Connie and Diane, saying our goodbyes and exchanging hugs and taking some group photos. 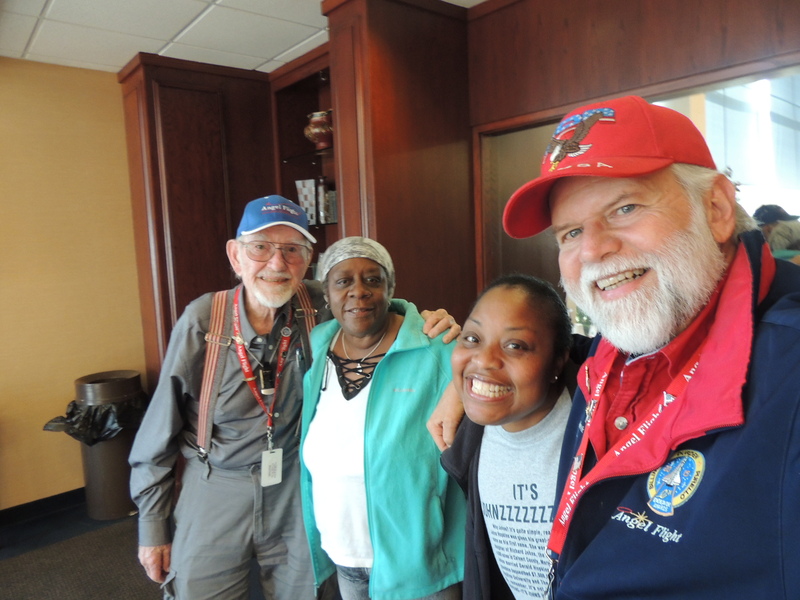 They made our heads swell telling us how much they enjoyed the flights both days, and how glad and appreciative they were to have had Angel Flight as a way for them to get to their destination ….. and to have had us as their pilots! They really made us feel good, and I can say this for both John and myself, the feeling was mutual! Connie, with her wonderful smile and fantastic personality, makes one really realize what is truly important in life and that in a moment our lives can change. And her mom Diane, being so close to her, giving her love and support, smiles and laughter…. these type things cannot be bought with money and they can not be achieved with medicine, they can only come from within ourselves. The fact is, even though we may be providing a way for our passengers to get to and from where they need to go, they in return are helping us stay in touch with the things in life that mean the most and what we need to hold the dearest to our hearts! (I think we may be getting the better end of the deal!) Thank you, Connie and Diane, for being our passengers these past two days! After our final goodbyes, we loaded up, got our clearance, and began the slow process of getting to our departure point. After getting over to the runway, we were about the 8th in line for departure, following behind a big Airbus. Finally, it was our turn and we departed Raleigh-Durham International headed for home! Our flight conditions heading home were very good with a smooth ride, clear skies, and a nice tailwind to help us along! Soon we were back into the beautiful Shenandoah Valley, as we neared home base Luray we set up for a visual approach and landed on runway 22. As I tucked 49Bravo back into her hanger, Captain John made the coffee (we take turns flying Angel Flights, but Captain John always makes the coffee and I always tuck 49Bravo in)! After we enjoyed our coffee (and boy was it good) we departed once again on one of the most dangerous parts of our day, the drive home. Thank you so much for your interest in our flights….. Have a great day! Following are some photos of our day………. 49Bravo sitting very proud with the big guys. Here we are making a turn over downtown Raleigh as approach control works on getting us merged into the major traffic coming into Raleigh-Durham International. They normally have 2 major parallel runways in use, along with a third, but presently they are down to just one due to construction and this is a very busy airport. We were behind two big “kerosene heaters”! Great! …… now we are number two for take-off! Beautiful tail fin art on this Air Bus 319 in front of us. The AR319 in front of us at Raleigh-Durham had a very busy day! Thank you so much for such kind words Diane! We love you all as well! It is amazing how much good a smile and a hug can do (much better than most medicines I do believe) We really loved our flights with you and Connie and or hearts where warmed by seeing your bond for each other. Take care and keep in touch…..and if any other flights needed… ask for John and Nevin! You are so sweet Diane! Thank you for your kind words Esther! ……… we certainly hope to get to meet you one day as well! What a ministry you guys have! You get to meet some of the most amazing people in the world and you get to see some of the most beautiful places around. And the greatest blessing of all is being able to help so many in their time of need! Thank you Kandi for your kind words!